There are only four days left in the Nordstrom Anniversary Sale (it ends August 5th) so today I'm sharing nine items that are still in stock and well worth buying. 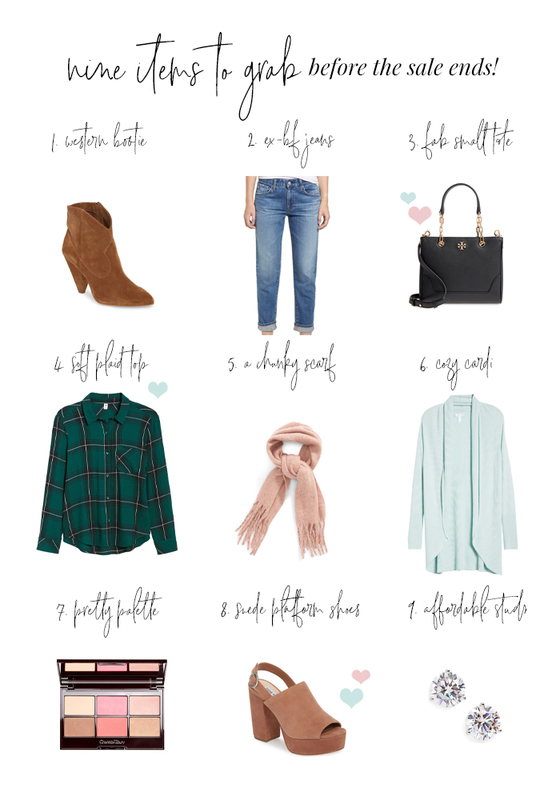 By now I've had plenty of time to use my beauty buys and repeatedly try on clothes and shoes, so I feel confident you will love all nine of these as much as I do! They are all great transitional pieces you can start using and wearing now and into Fall. All items are linked below and in-depth reviews are listed - just continue reading! 1. WESTERN BOOTIE. These western booties are one of my favorite purchases. At first, I was a little bit on the fence because of the shape of the heel (it can feel a tad wobbly) but after wearing them several times for various social occasions I'm 100% sold. There are tons of sizes left and they come in four colors. I love pairing them with a babydoll dress or shorts right now while it's warm - they look awesome! 2. EX-BF JEANS. The ex-boyfriend jean is incredible. I bought these last year in the distressed version and couldn't believe how well they wear and wash. Definitely, size down for the proper fit! My mom bought these this year too and loves them - they work really well for a variety of ages and body types. And the brand makes jeans you'll have for years. One of my other pairs is over two years old and looks brand new. 3. FAB SMALL TOTE. Oh, the small Tory tote! I can't believe this bag was even better in person. I knew I was going to like it the minute I saw it but I didn't realize how much. For the splurge, you obviously want to LOVE it, and I definitely do! The leather is nice and soft - it keeps its shape but isn't too hard to rigid. The crossbody strap is adjustable and removable, and the inside has just enough space for all the essentials. 4. SOFT PLAID TOP. This plaid top feels amazing! I included it because it's consistently been restocked in different colors and sizes. I ended up snagging the black & white and the green (love for Fall and holiday). It's really comfortable and even looks cute worn with leggings as it has a slightly longer fit. Don't delay though, the minute sizes come in, they go right back out again! 5. A CHUNKY SCARF. The best blush-colored chunky scarf I've found. It doesn't have any wool so it isn't itchy and it's nice and big so it'll do its job keeping you warm during the colder months. It's also stocked in two other colors (love the tan too) and under $22 so you could buy them all and not break the bank lol. I highly recommend grabbing one before the sale ends - the neutral colors would be great for cold-weather work attire. 6. COZY CARDI. There's nothing better than a cozy cardi and luckily they are all the rage again this year. They are one of the most purchased items from the sale and for good reason. You can pair with them a cami, a tee, a shirt, a sweater, or even a dress! I ordered this one last year in blush and absolutely love it. The blue is new this year and one of the prettiest hues I've seen. 7. PRETTY PALETTE. I've used this palette every day since I picked it up and love it. The colors are very pigmented so a little goes a long way (it will last quite a while). The blushes are definitely my favorite - one is a pretty pink and the other a fun summer coral. The packaging is nice and sleek making it perfect for travel and for stashing in your vanity drawer. 8. SUEDE PLATFORM SANDALS. These shoes were an unexpected favorite. They make your legs look SO much longer and are the perfect warm-weather shoe for flared jeans OR a great cooler weather shoe for dresses and skirts. I wore mine in Tuesday's post paired with some cute, casual jeans and a pretty lace top. You can easily dress them up or dress them down depending on the occasion. I'm going to be wearing mine on repeat! 9. AFFORDABLE STUDS. You can't go wrong with a fabulous pair of "real looking" cubic zirconia earrings (under $37)! I have three pairs of these in different sizes and LOVE the 6 ct pair I bought from the current sale. They are 3 ct per ear and huge haha which is how I wanted them. Literally cannot get enough! I just got my AG Ex-boyfriend jeans! I sized down one and they still fit a little loose but that's probably the point. Very glad I didn't get my regular size or they would have been huge. Thanks for the recommendation! They're super cute on you.